Entertainment One is launching Chinese new year ‘Year of the Pig’ celebrations with all new episodes of Peppa Pig, set to be broadcast to viewers across markets. 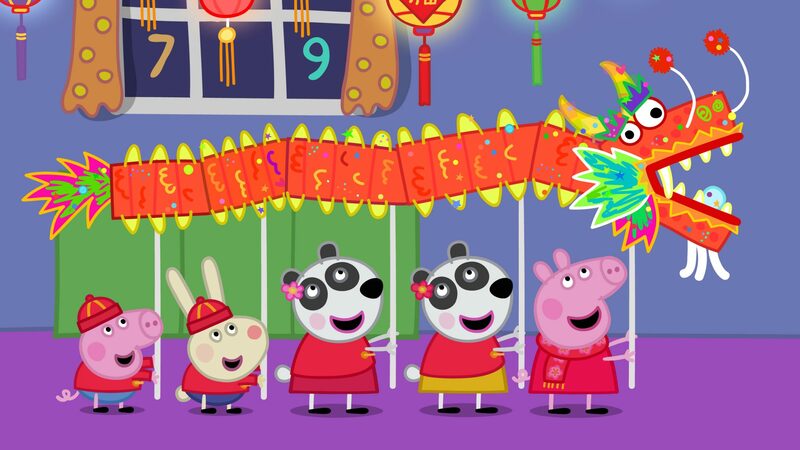 The specials centre on Peppa and her friends and family celebrating Chinese New Year and will begin airing on Tuesday 5th February 2019 in the UK, in honour of the ‘Year of the Pig’. Select markets will air the specials in Mandarin. Nickelodeon’s global network, including the US, will be joined by FTA broadcasters in multiple markets to air the themed specials during the Chinese New Year celebrations including: Australia (ABC) and New Zealand (TVNZ), Europe (Channel 5 Milkshake, RAI, France TV, CLAN), Canada (Treehouse), South Africa (ETV), as well as in local language in Asia, Taiwan (YoYo), and Hong Kong (nowTV). The broadcast plans are part of eOne’s overarching strategy to celebrate Chinese New Year ‘Year of the Pig’ with Peppa Pig throughout 2019, including a raft of plans for Chinese consumers. A nationwide cinema release, Peppa Celebrates Chinese New Year, co-produced by Alibaba Pictures will be released in China on 5 February. “We’re excited to unveil our latest plans to celebrate Chinese New Year with Peppa Pig fans around the world, thanks to a ground-breaking campaign we are rolling out with our broadcast partners around the globe,” said eOne’s Monica Candiani, EVP Content Sales, Family & Brands. 9 Story Media Group has launched a new live-action division and appointed Hyperactive Content’s Jeremy Slutskin as vice president. Slutskin, who will be based in New York and report to chief creative officer Angela Santomero, will lead the creative live-action content strategy. The newly minted division will make its debut at Kidscreen with a robust slate of properties for kids 2-14. Slutskin is an Emmy-nominated award-winning producer, writer and director with over 25 years of experience in feature films, television and commercials. From 2006 – 2018, he owned and operated Hyperactive Content, an award-winning production company that created and produced long- and short-form content for all platforms, on multiple continents. During his 12 years there, Slutskin created, wrote, directed and produced content for clients including, Nintendo, Awesomeness, Nickelodeon, Sesame Street, NBCUniversal, Mattel, Hasbro and others. “Launching this new live-action division is a natural next step in the company’s expansion,” said Vince Commisso, President & CEO for 9 Story. Channel 4 to air a special animated adaptation of the much-loved classic children’s book The Tiger Who Came to Tea by Judith Kerr, from the makers of We’re Going on a Bear Hunt and The Snowman and The Snowdog. The special animation will air for Christmas 2019. C4’s last festive children’s classic, We’re Going on a Bear Hunt, also produced by Lupus Films, was the Channel’s most watched programme of 2016 with over 8million viewers over the festive period. The Tiger Who Came to Tea was commissioned by Caroline Hollick, C4 head of drama and Chloe Tucker, C4 commissioning executive for drama. The title will be produced by Lupus Films’ founders Camilla Deakin and Ruth Fielding together with Ann-Janine Murtagh, Katie Fulford and Mia Jupp at HarperCollins Children’s Books, and directed by Robin Shaw (co-director We’re Going on a Bear Hunt, assistant director The Snowman and The Snowdog). The book has been adapted for the screen by Joanna Harrison (co-director We’re Going on a Bear Hunt, co-writer and art director The Snowman and The Snowdog).